Our self storage complex is only about 30 minutes drive from Sennybridge. 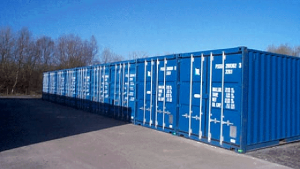 Benefit from exceptionally dry and secure storage containers in a self-contained site with barrier entry and digital CCTV. The storage complex is open from 8am to 5.30pm Monday to Saturday except Bank Holidays. If you are looking to store things a short drive from Sennybridge then come and have a chat with us. We offer extremely competitive rates and first class service.